Richie Boucher's pay of €843,000 is expected to be approved by shareholders this morning, with the government not using its 15pc stake to block it. BANK OF IRELAND shareholders are expected to approve an €843,000 pay packet for the chief executive of Bank of Ireland later this morning, after the government said it would not use its own stake in the bank to vote against it. Junior finance minister Brian Hayes said yesterday that the government’s policy was not to use its shareholding in the country’s banks to determine pay levels – and that it would instead wait for banks to return their own proposals for how to tackle pay. Last night a slew of Labour backbench TDs called on the government to utilise its 15 per cent stake in the bank – accrued through a €4.7 billion taxpayer bailout of the bank – to vote against Boucher’s salary, which is well above the government’s €500,000 salary cap for bank employees. A resolution confirming the pay for the chief executive and other senior staff will be considered at the bank’s Annual General Meeting in Ballsbridge this morning. Bank of Ireland’s annual report revealed that Boucher could actually have received a total pay packet of €910,000 – but he had waived €67,000 of his salary. Kevin Humphreys, Robert Dowds, Anne Ferris, Ann Phelan and Arthur Spring all said it was inappropriate that when other workers around the country were facing pay cuts or an uncertain future, the chief executive of a bank saved by public money could be paid so much. However, Hayes told the TDs that the government’s policy was to manage the banks on an ‘arm’s-length’ basis – meaning the government would not use its 15 per cent stake in the bank to directly vote on pay matters. “These frameworks, which are bank-specific, are published on the website of the Department of Finance, having been agreed with our international partners, the Troika,” Hayes said, saying each bank was expected to delivery a strategy on how to cut pay by the end of April. “However, I expect that any measures proposed will require sacrifices at all employee levels and strong leadership to be exercised by the banks in delivering in a timely manner. The stakes for all are high,” Hayes said. 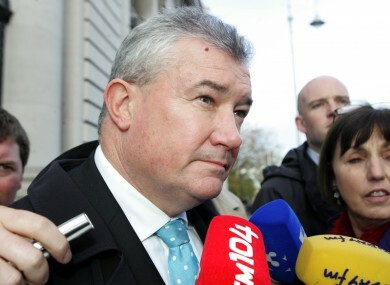 He said that Bank of Ireland was complying with policies on banking pay, however – saying the previous government had authorised Boucher’s pay in excess of the salary cap, but said: “I am reluctant to discuss the remuneration details of an individual on the floor of the House. The strong legal advice available to this and previous Governments is that pre-existing contractual commitments have to be honoured. In the case of the new CEO appointments at AIB and Permanent TSB, respectively, the Minister ensured the policy on remuneration was observed and it continues to be held. Arthur Spring urged finance minister Michael Noonan to use the 15 per cent shareholding “on behalf of the people”. Email “Government won’t use Bank of Ireland stake to oppose Boucher’s €843k salary”. Feedback on “Government won’t use Bank of Ireland stake to oppose Boucher’s €843k salary”.